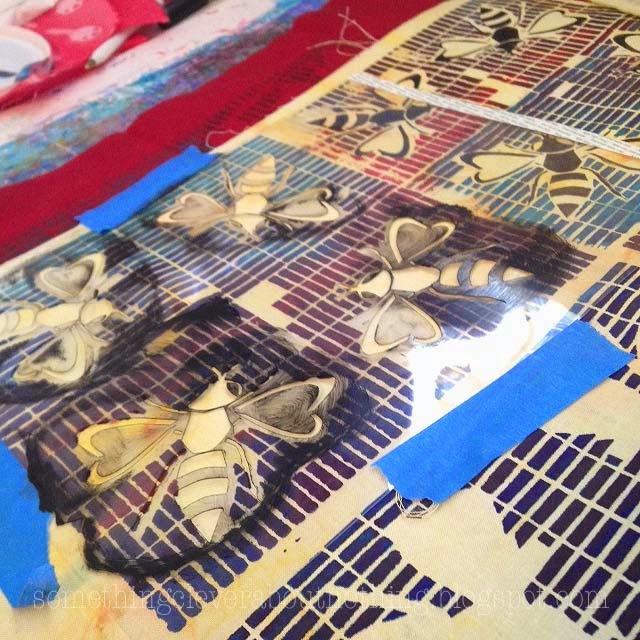 Julie Booth's theme for The Printed Fabric Bee was Mola. 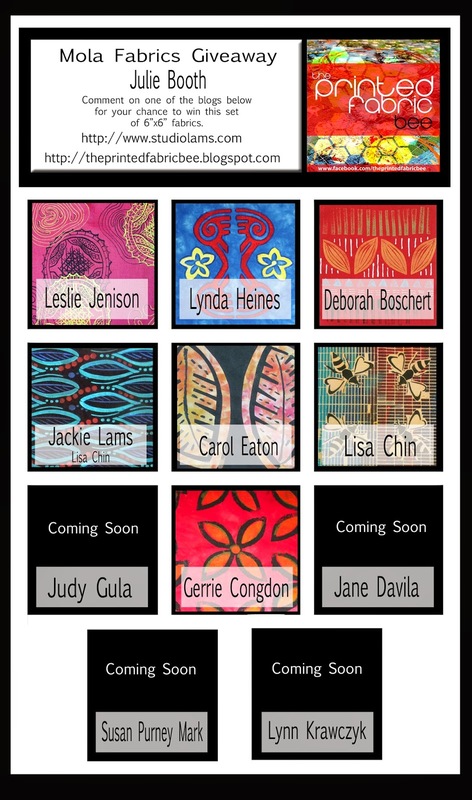 created by masterful Kuna women in Panama? Beautiful bright colors and striking designs in reverse appliqué. It certainly was a challenging theme to translate into paint and dye. 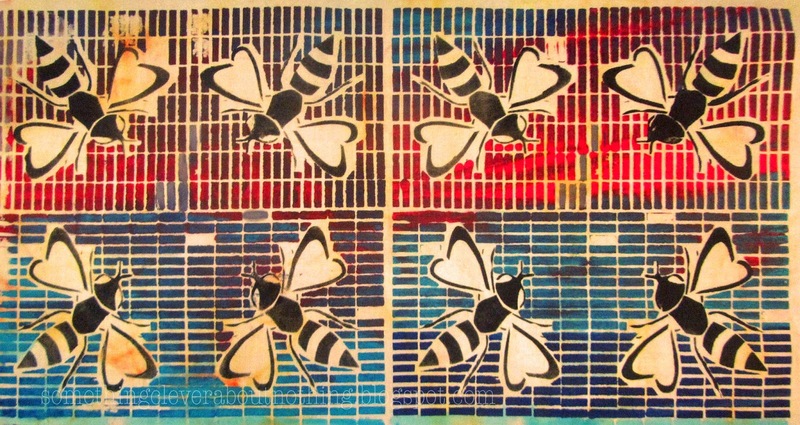 After studying many variations on Mola's I decided I wanted to use a bee - perhaps for obvious reasons - as the focus. I created two stencils using my Silhouette portrait. 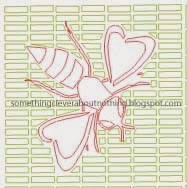 The first stencil was for the background (green) and the second was the bee (red). I started with a piece of hand dyed fabric in a very pale yellow. 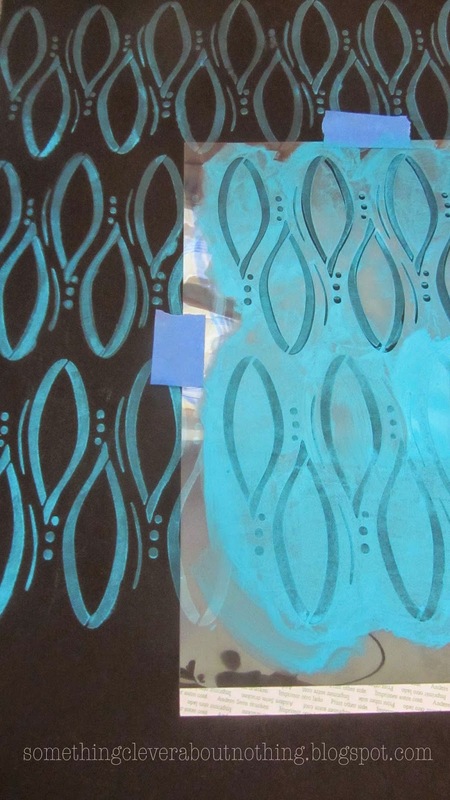 Next I taped the background stencil to a silk screen and screened several colors at the same time. 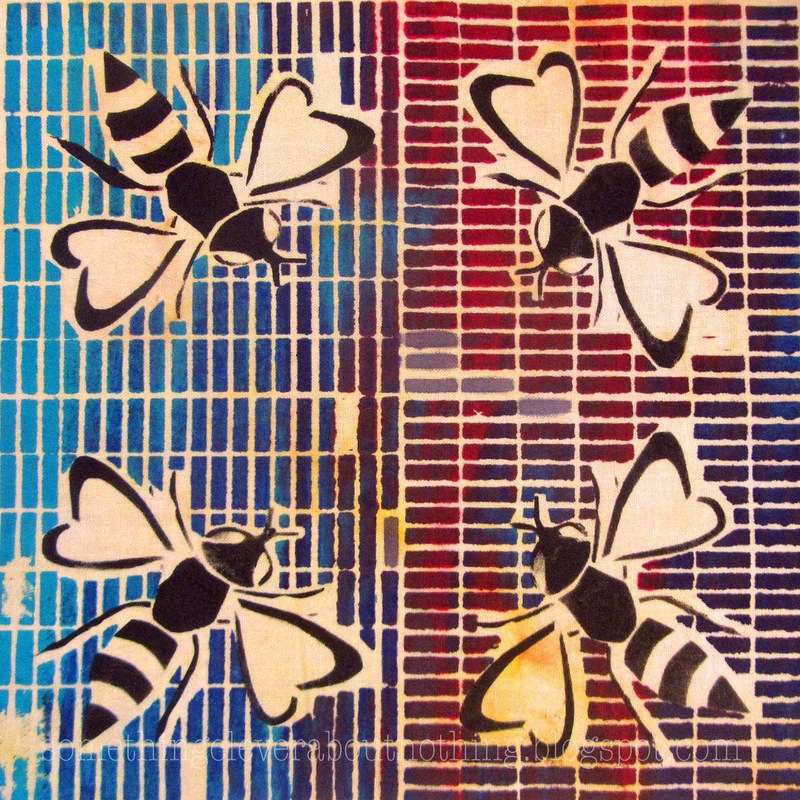 The bees were stenciled on last in black with the second stencil. I'm a little disapointed that my bees don't look very friendly. Here is the giveaway piece, which ended up a few inches larger than the normal 6x6". I had a great time making this month's piece. It is something different for me. There aren't layers on top of other layers. I continued playing with this idea when Jackie Lams told me she had been having a rough month and didn't think she would get a piece done. Jackie gave birth to beautiful BabyQ last month, and he was intensive care for some time afterward. She and BabyQ are doing fine now but there is always an adjustment period and it's been tough. I'm really glad I was able to continue working on this theme because I love how my second piece turned out! 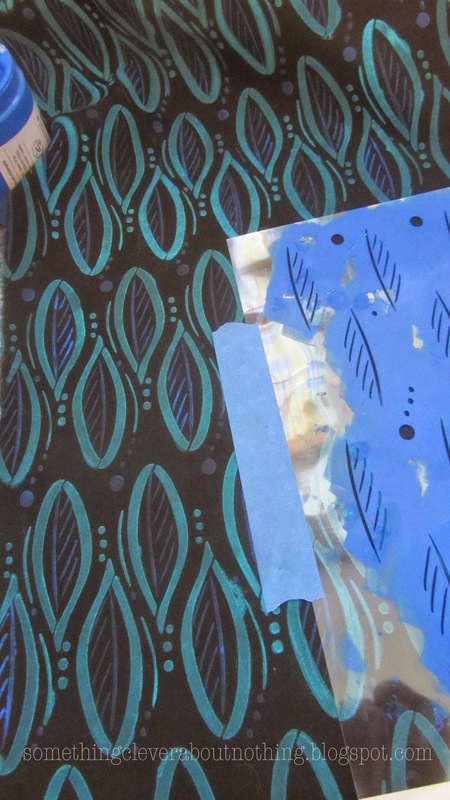 After creating three stencils of leaves, lines and dots that would interconnect I started on a black Kona cotton. 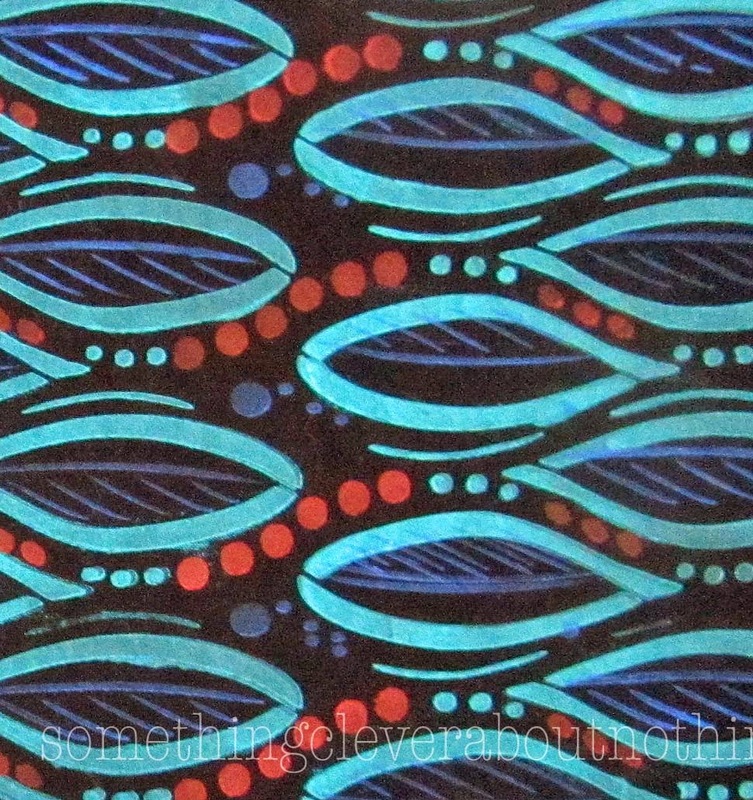 I used Speedball Fabric screen printing ink in Peacock blue for the first layer. Speedball Blue for the second layer. 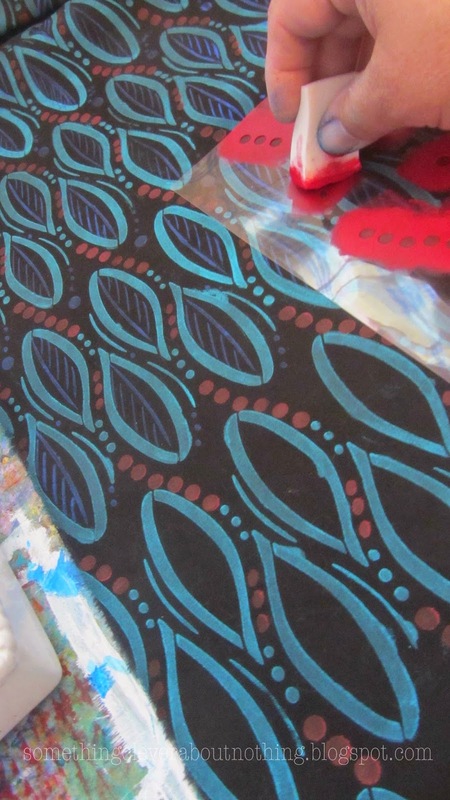 . . .and finally Jacquard Textile True Red for the third layer. I absolutely LOVE how this one came out! Love the way both pieces turned out! I think I like the second one best. Glad you were able to help out your friend. love both pieces but am especially lovin' the black fabric!!! Wow Lisa... so beautifully executed. These two special pieces are a definite example of your special connection with paints and fabric, resulting in simply stunning art cloth. Thanks for sharing the steps! Wow! Both pieces are wonderful! What is the tool you used on Jackie's piece to stamp on the paint? I need to find the "perfect" thing!